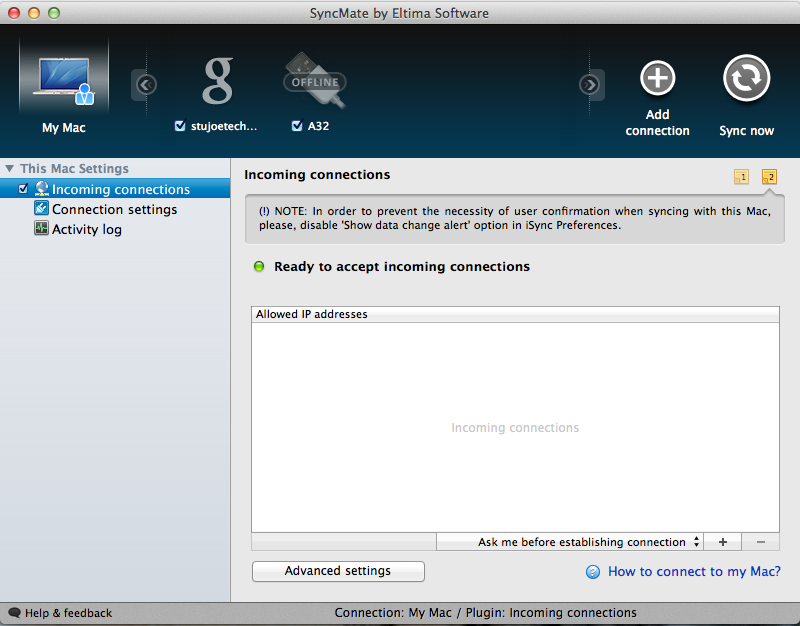 SyncMate is a tool that allows you to sync a lot of stuff from your Mac to a variety of other devices. You can sync your Android phone or tablet, Windows Mobile phone, BlackBerry, PSP, as well as flash drive, another Mac, or Windows computer. You can also sync your information to web services as well, such as Dropbox, your Google Account, and SyncMate’s own 50 Meg online storage service. Personally I think 50 Megs is small these days compared to other services, and they could really bump this up. ports you want the app to use. Then all you have to do is hit the big “Sync” button to begin the syncing process. If you’re syncing to a mobile device like Windows Mobile, Android, or iOS, you’ll need to download the SyncMate mobile app. Otherwise you’ll have to plug in the device to sync the information. While I think the ree version could really use some more features, they’re all added in the expert mode. I do find the reminder pop ups very annoying, especially if I haven’t been using the app for a while. You can download the app at http://mac.eltima.com/sync-mac.html. There is the limited free version, or you can upgrade to the paid version for $40.00, which gives you licensing or two computers. The download of the apps are free otherwise. 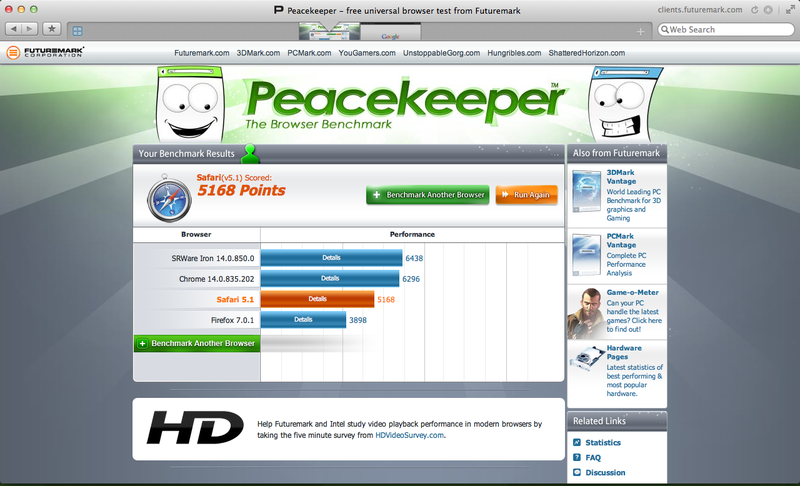 It is available for Mac’s running OS 10.5 or higher, as well as Windows XP and higher, and a variety of mobile systems. If you have any questions, comments, or suggestions about this or any other topic, leave a comment below or email me at easyosx@live.com You can also check me out on Facebook, Twitter, and YouTube by hitting the buttons on the top of your screen. You can also check out my Google Plus Page. Thanks! In recent years, the number of web browsers available for Mac has grown in recent years. Some have tried to stick to a Mac-like theme, or follow the path of Chrome and take a more minimalist design. And then some take a wholly different path, like Sleipnir. Sleipnir is a web browser that has been on Windows for a while and gained a devoted Japanese following in the process. Named after an 8-legged horse from Norse mythology, it looks about as strange, but has plenty of speed. Having used for a short while on Windows, and its release just last week from beta (or release candidate as the case may be), I decided to give it another go. Sleipnir looks completely different from any other browser I’ve yet to see. 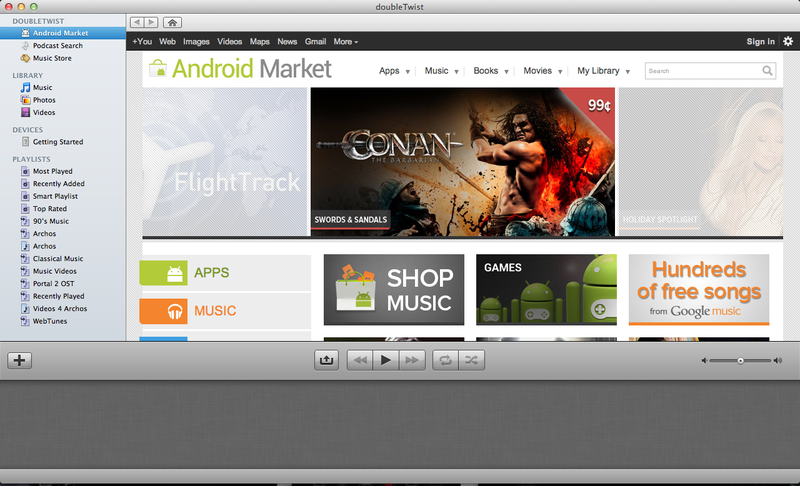 It has a really clean interface up top and can integrate well with Lion’s full screen mode. The tabs are integrated into the top of the browser, hidden inside the title bar with the back and forward button. Don’t see a URL bar to type you web address? On the right side the site’s name, HTTPS status, reload button, and a download icon/manager, much like Safari 5.1. Click on the URL, and the URL bar opens up and lets you get to the site you need. WHen you’re done, it retracts back to a smaller size, returning a title bar. I have to say that as strange as it is, it actually feels like a design choice that Apple could have made themselves. Interestingly there are a couple seeming design flaws in it. While I had the option to show a bookmarks bar, I never could get it to show up. Sleipnir also has no Home button, even though you can set a homepage, which is a rather strange setting for a browser. has gesture support for those using Trackpads: a two-fingered swipe left or right takes you back or forward in that tab’s history respectively. A two-fingered pinch in also shows you an overview of your tabs. You also can organize bookmarks into several pre-made categories, such as shopping, research, and more. It also has a read it later feature, which I like but I think should be more prominent. You can also sync bookmarks using the Fenrir Pass to other copies of Sleipnir, including those on other platforms, like iOS. The iOS version also has some neat features, like Hold to Go, gestures, and touch paging. Hold to Go lets you press and hold on a link or bookmark to open it in the background. Gestures include drawing a circle to reload the page, and S to start searching, and more. Lastly, the TouchPaging feature allows you to scroll through your tabs by flick left or right. Back to the Mac version for a minute though, there a several flaws that just put me off. For example, there is no security settings in the Preferences, which would be nice to have. And while the Windows version has a few extensions, none of them work for Mac. Full screen in Flash also still shows the menubar, which I have mixed feelings about. I also would still like that Home button. Overall, Sleipnir is a really quick and interesting browser that could shake up the game if it gained traction, but it feels like it is incomplete. But for quick web browsing and a new browser experience, Sleipnir makes for one heck of a ride. It is available for Mac OS 10.6 and higher (Snow Leopard and Lion) & iOS (iPad and iPhone). It also works for Android as well as Windows 98, XP, Vista and 7 (that’s not a typo, it really can support Windows 98). You can find the version you want at http://www.fenrir-inc.com/ or check out the Mac specific version at http://www.fenrir-inc.com/global/mac/sleipnir.html. If you have any questions, comments, or suggestions about this or any other topic, leave a comment below or email me at easyosx@live.com You can also check me out on Facebook, Twitter, and YouTube by hitting the buttons on the top of your screen. You can also check out my Google Plus Page at https://plus.google.com/107817518299218190319 Thanks!